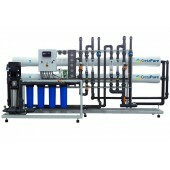 The process of operation of a commercial reverse osmosis system consists of the following stages of water purification. The water supplied to the osmosis is pre-cleaned by a 5-micron sediment filter included in the unit. The water is fed to the membrane by a high-pressure pump. During the treatment the water is divided into two flows inside the membrane module of the system: demineralized water, or permeate, and water with increased salt content, i.e. concentrate. Part of the concentrate is discharged into the sewage system while the module is operating, and part of it is sent to the inlet of a high-pressure pump, to recycle the concentrate. An antiscalant can be dosed into the feed water stream, which prevents the formation of deposits inside the membrane elements. Demineralized water (permeate) is supplied to the storage tank of permeate, where a float switch is installed, which switches off the system when the tank is full. The system is automatically rinsed with feed water before it is switched off or at predetermined intervals. This mode is called the hydraulic flushing mode, during which the system requires a short-term 1-2 minutes water supply exceeding the water supply in service mode. Blockings and preventive alarm in case of emergencies to protect the pump from dry running, membranes from high pressure etc. Measurement and display of electric conductivity and temperature. Sediment filters are designed to protect membrane from large impurities such as sand, clay particles, etc. Delaying the change of the replacement filters can damage or destroy the membrane. 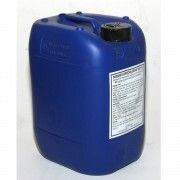 In order to avoid such critical situations, we recommend changing the replacement filter at least once every 3 months. If the quality of the treated water has deteriorated or a decrease in productivity has been noted, it is necessary to conduct chemical cleaning of the reverse osmosis membrane with a CIP-station and special reagents. To obtain purified water of unchanged quality, we recommend that chemical cleaning of the reverse osmosis membrane be carried out at least twice a year. If you do not plan to use the system for a long time, it is recommended to shut off the water supply to the system, and also to preserve the membrane elements using a special preservative solution - this will keep the membranes working when idle. It is recommended to keep technical service journal of the reverse osmosis system and a log book of the system performance and water quality. The availability of the history will lead to timely replacement of replacement filters, chemical cleaning of membranes and other maintenance operations connected to the system service. Αφαλάτωση 6.720 λίτρα / ημέρα. 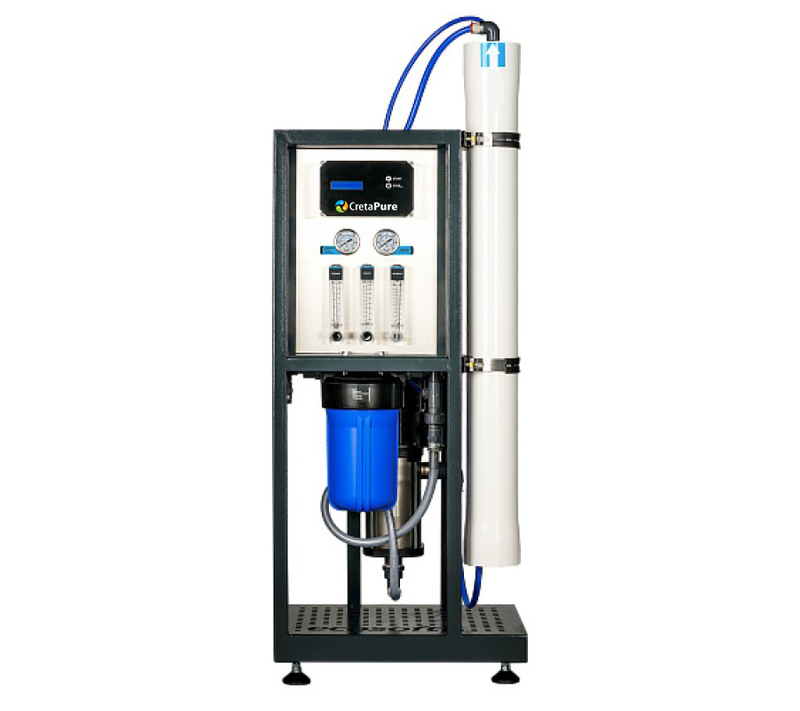 Creta Pure MO 6.720 сommercial reverse osmosis system is a compact, light and energy-efficient solution with the productivity of up to 6.720 L/day. Use of Dow Filmtec™ membrane provides a consistently high quality of purified water and allows regulating the yield of permeate depending on the quality of the source water, providing values up to 75% without having any risk to the membrane condition. 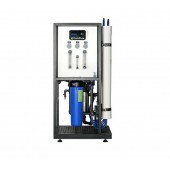 Stable operation is provided by Grundfos high-pressure pump. A state-of-the-art controller provides complete automation of the system. The controller is equipped with permeate conductivity sensor, which allows continuous monitoring of the purified water quality. The compact design of the system and the specially designed connection panel greatly simplifies the transportation, installation, and maintenance of the system. The use of flexible connecting tubes provides a significant reduction in vibration and noise generated by the high-pressure pump. 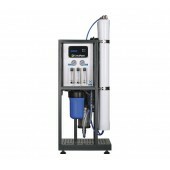 Creta Pure MO 6.720 commercial reverse osmosis system is designed for water purification in private houses, cafes, restaurants, laboratories, in the industry for small technological processes, for steam boilers and steam generators. Reliable performance due to high-quality engineering and components. Saves space due to compact original design. Easy-to-use due to smart architecture. Saves up to 50 % of energy - due to highly efficient Dow Filmtec™ RO membranes and Grundfos pump.